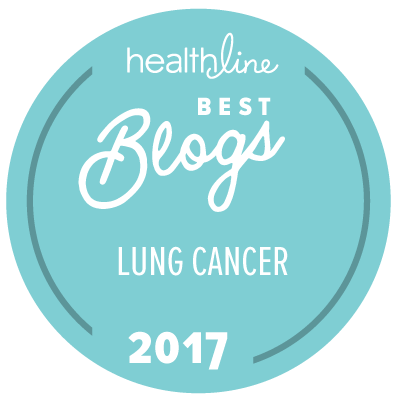 THIS IS A REBLOG OF A POST I WROTE FOR THE #LCSM CHAT BLOG. The October 24th #LCSM Chat on “Social Media and Lung Cancer Advocacy: What Can I Do?” identified lots of information that the public needs to know about lung cancer. Chat members decided we’d like to tweet those facts during Lung Cancer Awareness Month (#LCAM2013) this November. Some suggested we all tweet the same fact each day to generate the greatest impact on Twitter. To coordinate this effort, the #LCSM team compiled a list of lung cancer tweets based on verified facts – one tweet for each day in November. Links to the sources for the facts are listed below the tweets for those who want evidence. @LCSMChat will tweet each day at 11:55 AM Eastern Time if you prefer to retweet rather than come here to find the tweets. Week 1 tweets are listed below. Tweets for Weeks 2-4 will be blogged later in the month. If you subscribe to the #LCSM Chat blog, you will receive an email when our blog posts are published. All the facts will also be available on a “Lung Cancer Facts” page of the LCSM Chat site for easy reference. Johns Hopkins Medicine. Guide on Lung Cancer in Never-Smokers – Different Disease Different Treatments (09/15/2009). Retrieved Oct 30, 2013, from http://www.hopkinsmedicine.org/news/media/releases/Guide_on_Lung_Cancer_in_NeverSmokers__Different_Disease_Different_Treatments. U.S. Cancer Statistics Working Group. United States Cancer Statistics: 1999–2010 Incidence and Mortality Web-based Report. Atlanta: U.S. Department of Health and Human Services, Centers for Disease Control and Prevention and National Cancer Institute; 2013. Retrieved from http://apps.nccd.cdc.gov/uscs/toptencancers.aspx. To access data, select year 2010, “death rates” tab and view table for all ethnic groups Per CDC, 2010 cancer deaths were caused 37.9% by lung cancer and 21.9% by breast cancer in women, 60.1% by lung cancer and 21.8% by prostate cancer in men. SEER Cancer Statistics Factsheets: Lung and Bronchus Cancer. National Cancer Institute. Bethesda, MD, http://seer.cancer.gov/statfacts/html/lungb.html In the United States in 2013, it is estimated there will be about 159,480 deaths from lung cancer. Approximately 6.9 percent of men and women will be diagnosed with lung and bronchus cancer at some point during their lifetime. Centers for Disease Control and Prevention. MMWR Weekly 56(44);1157-1161. (9-Nov-2007). Retrieved Oct 30, 2013, from http://www.cdc.gov/mmwr/preview/mmwrhtml/mm5644a2.htm. Lung cancer cases are 17.9% never smokers, 61.2% former smokers, 20.9% smokers (see Table 2, lung neoplasms). SEER Cancer Statistics Factsheets: Lung and Bronchus Cancer. National Cancer Institute. Bethesda, MD, http://seer.cancer.gov/statfacts/html/lungb.html Current 5-year survival rate of adults with lung and bronchus cancers is 16%. In 1975, the 5-year survival rate for lung cancer in adults was 11.4%. National Lung Cancer Partnership. What You Can Do (graphic). (Mar-2013). Accessed from http://www.nationallungcancerpartnership.org/images/uploads/files/NLCP_FS_1Facts_NextDayFlyer_2013_BACK.pdf. American Cancer Society. Cancer Facts and Figures 2013. Atlanta: American Cancer Society; 2013. Accessed 20-Oct-2013 from http://www.cancer.org/acs/groups/content/@epidemiologysurveilance/documents/document/acspc-037115.pdf. U.S. Army Medical Research and Materiel Command, Department of Defense. 2012 Congressionally Funded Medical Research Programs. (30-Sep-2012). Accessed from http://cdmrp.army.mil/pubs/annreports/2012annrep/2012annreport.pdf. NIH Research Portfolio Online Reporting Tools. Estimates of Funding for Various Research, Condition, and Disease Categories (RCDC). (10-Apr-2013). Accessed from http://report.nih.gov/categorical_spending.aspx. US Environmental Protection Agency. Radon. (26-Aug-2013). Accessed from http://www.epa.gov/radon/. This entry was posted in Advocacy, Lung Cancer and tagged Lung cancer, Lung Cancer Awareness Month. Bookmark the permalink. Thank you for this! I will be tweeting these on the appropriate days starting tomorrow. I tweeted 1st and 2nd just now as I forgot about it. But now they’re all scheduled!